Adobe’s Photoshop Fix is a great, specialized app for quick touch-ups and spot healing. 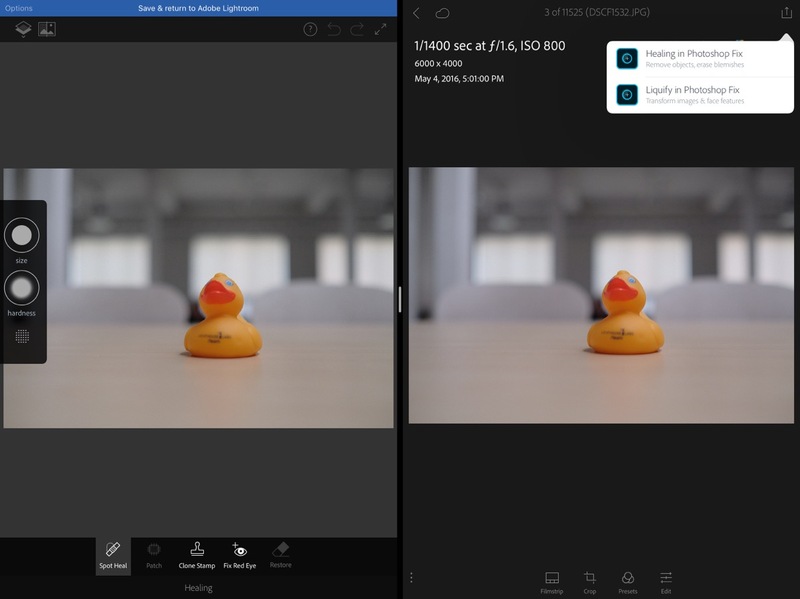 These tools are built right into Lightroom on the desktop, but they’re absent from Lightroom Mobile, so for now we require separate apps like Photoshop Fix and Photoshop Mix to achieve what would normally be possible in one app on the desktop. However, thanks to the sharing capabilities of apps in iOS 9, it’s pretty easy to send a picture from Lightroom into Photoshop Fix for touch-ups, and then send it right back. The problem, until very recently, was that Photoshop Fix (and Mix) had some major issues with resolution. The app could import files at full resolution, but it would only save them at a maximum of 2000×2000 pixels. That’s far less than the 6000×4000 resolution that I was importing that. However, as of version 1.3, Photoshop Fix and Mix are able to export in full resolution. I took a little time earlier today to test this new functionality out. While you can import files from Lightroom or the Camera Roll right into Photoshop Fix, the best workflow I’ve found so far is to start in Lightroom Mobile. I like to go through pictures in my catalog there and then use the Share Menu -> Edit In -> Healing in Photoshop Fix. I don’t do that much selective brightening (I usually use a tone curve for that), but I do like the Healing Tool in Photoshop Fix. This workflow works out especially nicely if I have Split View open. With Lightroom open on the left side of the screen, I can start to make selective edits to my shots in Photoshop Fix. The strange thing about this is that working this way limits me to only the Healing tools. If I want to change the shape of certain objects or selectively lighten or darken an area, the controls are simply not there. Photoshop Fix seems to load up in a very particular mode when you share pictures from Lightroom, and it’s almost as if it’s running as a giant app extension (which usually has functional limits), instead of a full-fledged app. Adobe does make good on their promise of full-res exports, for the most part. After making my changes in Fix, I can tab the blue bar at the top of the screen to save the changes and return to Lightroom. However, the changes aren’t made non-destructively and applied to the existing picture. Instead, an entirely new JPEG is imported to Lightroom, which shows up right beside the original. I exported a test shot to the camera roll to check on its resolution and found that it was, indeed, still 6000×4000 pixels. However, Adobe isn’t really telling the full story about what Photoshop Fix does to an image. The file size of an edited shot may be the same resolution, but I’ve noticed that it’s about one fifth of its original size. My FINE JPEG out of a Fuji X-Pro 2 is 11.1 MB and the same picture edited in Photoshop Fix is only 2.5 MB. I can’t see any noticeable difference in colour or sharpness when I do a side-by-side comparison in the Photos app or push the files in edits, but I do wonder what kind of data I’m losing with a Photoshop Fix export. I also noticed that, although most of the metadata stays in place, Photoshop Fix doesn’t seem to keep the Lens EXIF info. So if you later want to sort through your photos based on the lenses you used in a shot, photos exported from Photoshop Fix just won’t register. With all of this in mind, Photoshop Fix does seem to work a lot better now that it can export in full resolution, and I think I may consider using it over Pixelmator for touch-ups. It’s probably going to be the last stop when editing photos, though, just because that file compression makes me a bit nervous.